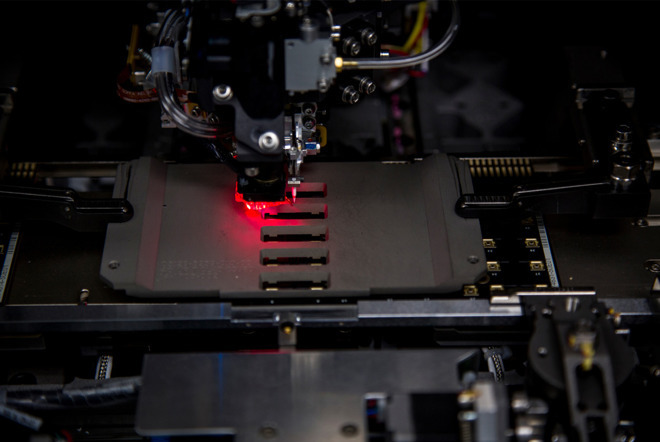 Dormant since 2011 and purchased last year for $20 million, Finisar will be using the Sherman facility to produce more of its VCSEL lasers, which are used to power the iPhone X's Face ID facial recognition and tracking system. Previously used by MEMC for producing silicon wafers, the KXII report reveals the company is still working to install its production lines, in anticipation of high demand. "Everything this facility offers is necessary for us," said Finisar Allen Vice President and General Manager Curtis Barratt. "It's a super set of what's required, it's just a big, strong, versatile building." The facility will be employing up to 600 workers when it is up and running, but it has already hired several managers and engineers that are working with construction personnel, including some former MEMC employees. As well as moving some Allen employees over to the project, the firm also intends to hire from the Grayson County area, with the search including a hiring fair due to be held on April 12 at the Hilton Garden Inn in Denison. Barratt advises approximately 90 percent of the equipment for the production lines is on order, and will start to be installed in April or May. Manufacturing the VCSEL components will start shortly afterwards, Barratt suggests, adding""We'll start the line's first articles by August and production will get going by October." While it will be a major VCSEL supplier to Apple, Finisar's ambitions for the facility extend further into other industries. "We're making Sherman the VCSEL capital of the world," Barratt told the report, continuing "everything from self-driving cars, to gesture recognition, to facial recognition, all of these applications are going to make this a very, very important location." The importance of VCSELs in the iPhone X and its potential use in future devices prompted Apple to grant Finisar $390 million in December, to "exponentially increase" its high-volume production and research and development. At the time of the announcement, it was confirmed the Sherman facility's purchase was directly related to Apple's grant. The grant was provided by Apple's Advanced Manufacturing Fund, which the firm intends to use to support U.S. manufacturing. The first investment from the fund was in May last year, providing $200 million to Corning - the producer of the Gorilla Glass used in a number of Apple products.